Designed specifically for mobile slots players, Rose Slots is a gaming site with a huge range of slots online. With highly intuitive design and simple navigation, we make playing the best online casino slot games as fast and easy on mobile as it is on your laptop or PC. There are over 500 uk slots to choose from, from the Irish themed ‘Rainbow Riches’ with magnificent Celtic themed graphics, to the dark, gothic themed ‘Immortal Romance’. With so much choice, it can be difficult to decide which the best slots to play are. That is why we have put together this handy guide to help you decide which games are best for you at Rose Slots. Developed by Eyecon, Fluffy Favourites UK slot is a cuddly toy themed slot game that is bound to evoke a child-like sense of nostalgia. Each of the animal themed symbols possess a different numerical value. The display consists of 5 different reels, over a 25 pay line slot. Simply, match the symbols to win a prize. Fluffy Favourites also has a number of bonus features, adding even more excitement to the game. Lining up 3 of the claw symbols will unlock the toy box. The toy box is a feature that allows the player to choose a symbol that can match, with the addition of a 100x multiplier! Another bonus feature to watch out for is the pink elephant. This adorable figure allows you to substitute a symbol for additional multipliers on the reels. In addition, the elephant is one of the highest paying symbols. 3, 4 or 5 of these will trigger 15, 20 or 25 free games respectively, no matter what order or reel they are on. If you are looking for simple slots online, with a fun and vibrant theme, then Fluffy Favourites is definitely worth a try. 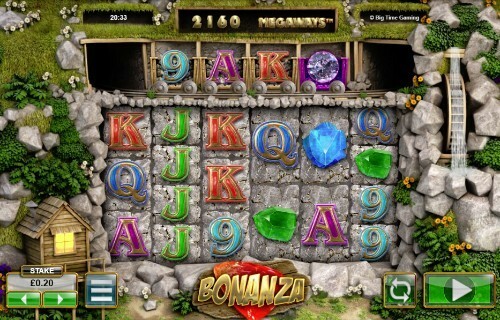 With an impressive Return to Player rate of 96%, Bonanza slot game is one of the best slots in terms of winning potential and enjoyment that we have come across online. While not as theme specific as Fluffy Favourites, the game features impressive 3D graphics that display a woodland setting. Sound effects are well matched to the imagery also, helping to create a more immersive experience. However if you are playing in a public space you should be mindful of your device’s volume, as these effects can be especially noisy during spins. The game consists of 6 reels and 7 different symbols. Above the reel there are carts of rolling symbols, which become active on reels 2 through to 5. By collecting letter icons, you can work your way up to spelling out the word GOLD. Doing this will then activate the Scatter feature. This is where the real fun starts. The Scatter feature brings with it the opportunity for even higher wins! You will be awarded with an extra 12 games and if you are lucky enough to find a +5, a set of new spins will be added to the deck. 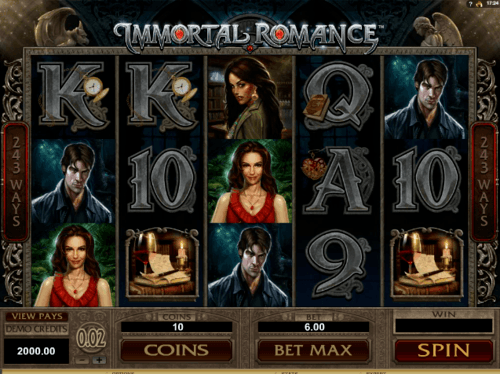 Number 3 on our list of the best slot games is Immortal Romance. Progressive game developers Microgaming have created this slot game with a dark and mysterious theme in mind. High-quality graphics, featuring vampires and other mythical creatures are accompanied by an eerie, tension-building soundtrack. This game is not for the faint of heart. As a 5 slot reel, Immortal Romance has around 243 paths to victory. A unique feature within this game is the wild desire feature. At the press of a button you can send the reels into a wild spin. While the results are completely random, having 5 wild reels could massively boost your score, and consequently boost your winnings. Captivating and colourful, Starburst Slot UK is a thrilling online slot game without a complicated storyline. It is widely regarded as one of the best slots online. Developed by Swedish company NetEnt, this is one of the most well-known games of its kind. It features an array of sparkling, vibrant jewels that resemble the opulence of a luxury Las Vegas casino. There are 10 play lines with its 5 reels and 3 rows. 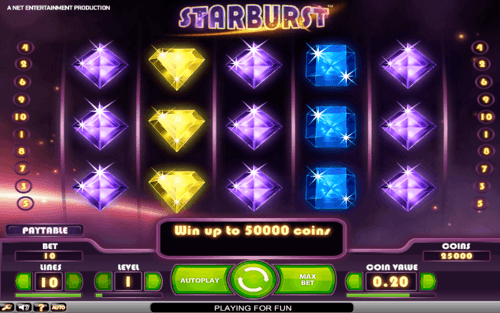 Because of its simplicity, Starburst is a good starting point for players who are new to slots games or online gaming. A great feature in this game is the ability to change the best value and level before each individual spin. Another bonus is the win-both-ways feature, which gives you the ability to win from left to right of the reels. This means that you can win money simply by matching 3 symbols in horizontal rows. With a Return to Player figure of 96%, it would be silly not to take a spin on Starburst’s slots! 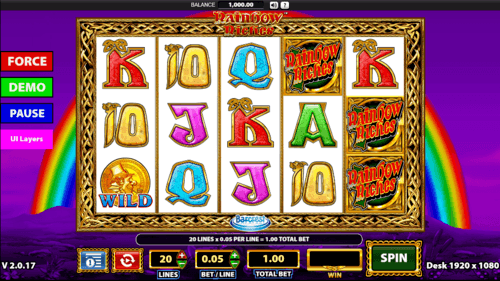 Lastly, we recommend that you try your luck on Rose Slots’ Rainbow Riches game. Set in front of an eye-catching rainbow backdrop, there are 5 reels with 3 rows and 20 different pay lines. With a wild gold coin, which replaces all other symbols apart from 3 scatters, you can complete wins. If you are lucky enough to come across 5 wild coins, you will receive an impressive 25x multiplier on your total bet amount! With a betting range of anything between 1p to £400, this slot game can be played no matter the size of your pot of gold. If you are short on time you can use the AutoPlay feature for uninterrupted spins. Rose Slots provides are incredibly diverse range of themed slots games, there is something to suit everybody’s skill level and interests. We hope that you have found this guide useful in deciding which online slots are the best for you.